Guards at a checkpoint near burning oil fields in Qayara, south of Mosul, Iraq, Nov. 22, 2016 (AP photo by Felipe Dana). Earlier this month, on Nov. 5, militants from the self-proclaimed Islamic State killed 26 civilians with a roadside bomb as they fled Hawija, a predominantly Sunni Arab town about 40 miles southwest of Kirkuk. 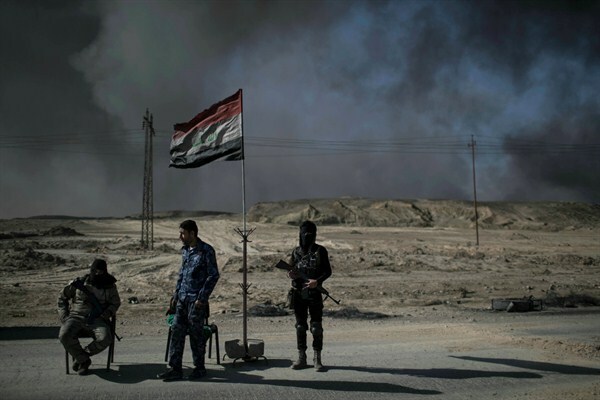 With international attention focused on the battle for Mosul, the attack was just the latest sign of the ongoing humanitarian and security crisis on a forgotten battlefield in another part of northern Iraq.